As always, you are an incredible writer and clearly passionate about this subject. 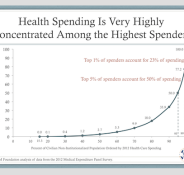 I always get a little nervous when I hear doctors talking about population health instead of individual patient health, “quality” measures in medicine, and bending cost curves in medicine. The baby boomers are aging and their health care costs are high and going to get higher. I realize that the government and other third party payers are concerned about those costs. However, my oath was to my patients and not to the government or the insurance companies. I’m not suggesting that your agenda is misplaced in any way, shape, or form. What I have noticed, however, is that the language and marketing efforts that have taken place by the third party payers / regulators has become so pervasive that I am starting to see my physician colleagues using it. Take for example the term “quality.” The government says their explosion in regulation is to ensure quality care. However, the government has administered both the VA and IHS systems for decades. While both of those systems have some really great doctors in them, the systems themselves are lacking. If they know so much about “quality” then why don’t they institute it in their own systems? The real answer is that “quality” is just a marketing term that they use to sell to the public that they intend to try hard to bring down the cost of health care. The really unfortunate thing, in my mind, is that I see a lot of doctors talking about these “quality” measures like they are real. However, it has been spoken about so much that it is now in everyone’s lexicon (even the doctors). Population health is another one of those terms. Sure population health is an important part of public health. However, a doctor’s oath is to their individual patients. I never want to see the day in which a doctor’s decision making for an individual takes into consideration populations. One doctor, one patient, and whatever is best for that patient regardless of cost.